Chief bird in charge of hiding under couches. Named for the song. Little did we know at the time that every female eclectus in the world is named Ruby. How tragically unoriginal of us. Eclectus are unusual in the parrot family for their extreme sexual dimorphism; males are bright green, with bright "candy corn" colored beaks and blue or red tail and wing feathers; females are red headed and blue-breasted, with black beaks. Initially, scientists had identified male and female eclectus as members of separate species. It wasn't until the 20th century that it was simply a difference of plumage. Ornithologists usually classify the Eclectus parrot as members of tribe Psittaculini in the Psittacidae family of order Psittaciformes, however, current thinking seems to be to place them in the Loriinae tribe. It is thought that there are eight to ten subspecies in the wild, each with differences in size and coloring. Eclectus are native to the Solomon Islands, New Guinea, northeastern Australia and the Maluku Islands (Moluccas). 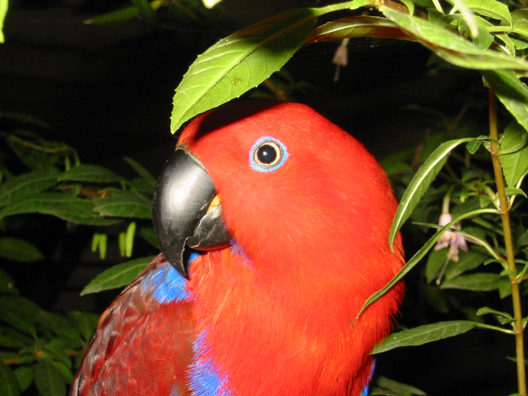 The Solomon Island Eclectus is the smallest of the subspecies. 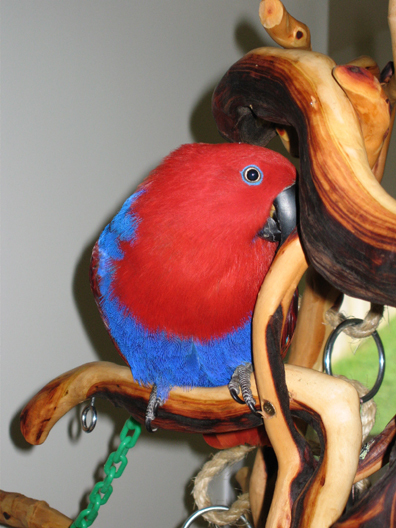 Solomon Island females can be identified by their cobalt blue breast with a definite bib, a ring of blue feathers surrounding the eye, and a solid red tail.